Is your husband the spiritual leader of your home? Would you like him to be? Okay, so since spiritual leadership encompasses SO much more than just reading the Bible or praying, chances are your husband is already taking steps to lead your family — you just may not have recognized or fully appreciated them. Personally, once I began to understand spiritual leadership in the sense of “modeling what good Christian living looks like and trying to encourage the rest of the family to live that way too” instead of JUST doing family devotions or praying together, it completely opened up my eyes to all the many, many, many ways my own husband leads our family — ways I was completely oblivious too until I intentionally went looking for them! 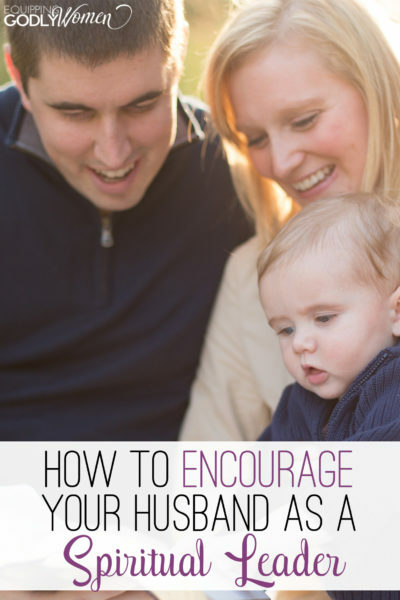 How does your husband seek to grow in faith (even if it’s quietly on his own) and encourage your family to do the same? If so, he’s probably more of a spiritual leader than you realize. After all — how difficult must it be for our husbands to lead when we refuse to follow or when we constantly criticize their leadership? (Whether we mean to or not) And the tricky part is — we often do so without even realizing it. If you suspect this *may* be an issue in your marriage (and even if you don’t), it’s definitely worth it to check in with your husband to see if there are any things you’ve been doing – even with the best of intentions – that are coming across as disrespectful to him or undermining his leadership for your family. During this time, while the “rules” of your relationship are changing, you both may feel a little insecure, uneasy or unsettled. Hopefully you both want to do the right thing for your family, but you’re likely still figuring out what that is and where the boundary lines are. Is your husband the spiritual leader in your family? How does he lead your family? What do you do to encourage him as a leader? I learned early in my marriage that when I stopped focusing on the things I wanted my husband to be doing and instead praised him for the leadership he was providing that there was more peace in the home. This is why I love your advice on openly communicating and expressing expectations. So much understanding and love can be expressed when couples take time to do these two things.